The Final Fog, and a Winner! I’m sure this won’t be the last fog photo to ever grace my blog, but it might just be one of the final fog photos of this year. Our days have turned sunny and warmer and the fog has been mist more often than not on my morning walks. Spring is coming! Enjoy this last little bit of the fog, knowing that the change of season is coming soon. Who won the postcards, from the Exploring with a Camera: Fog link in? My dear friend Mosey of mosey along. Mosey, these will be in the mail to you soon! Thank you ALL so much for linking in with your wonderful fog photos. I loved seeing them. Join me tomorrow for a brand new Exploring with a Camera topic, I’ve got a fun one planned and I can’t wait to share it with you. See you then! Yesterday I took my camera and spent time noticing the details of Parco di Monza as fog hid the greater world. I saw new things, like the moss and roots of this tree, because I was looking closer. I almost felt done with the fog this year, but I reviewed my images from yesterday’s photowalk and I’ve fallen in love with fog all over again. Have you seen fog this last week? 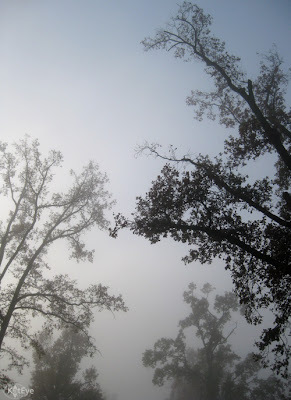 Did you find a favorite fog photo in your archives? It’s not too late to share your view! Even though I opened the linky in last week’s Exploring with a Camera post on Fog, you can still link up for another week. Come by the blog to see who’s already joined in. Visit some of these sites, there are some wonderful and creative fog photos included already. Don’t forget there’s a giveaway of postcards too – I’ll draw a winner from those who link up. 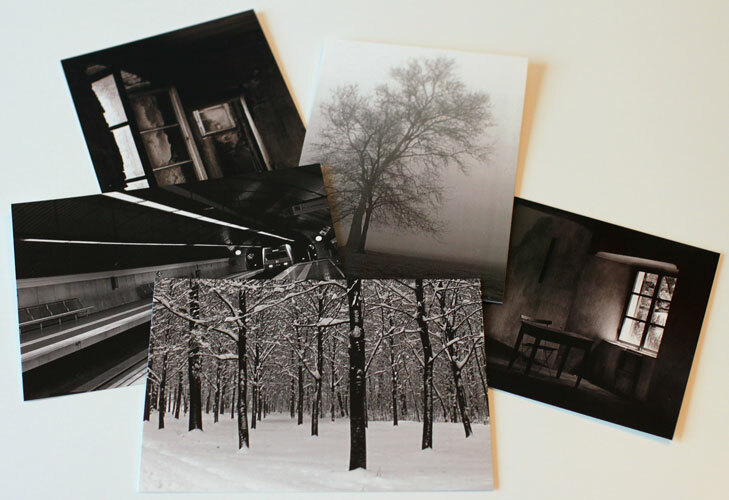 One lucky person will win a set of my Black and White postcards this week! I can’t wait to find out who it will be. 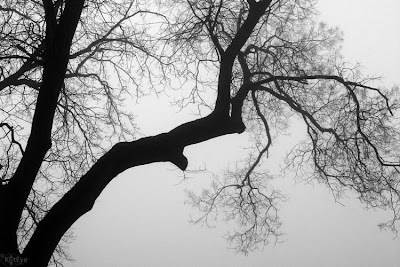 Winter brings fog, one of the most wonderful weather patterns for photography. 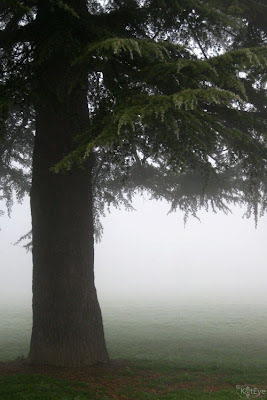 I know I’ve said it before here on the blog, but I love fog! Because you can only see what is right in front of you, there is a delicious sense of mystery, of things slowly revealed. Fog forms when there is high humidity along with a temperature that is very close to the dew point, it is essentially a low lying clound. 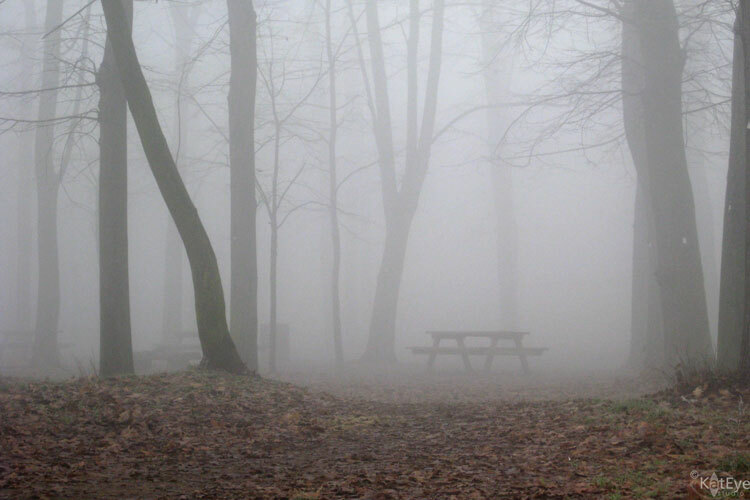 You can read more about the science of fog here. It will form readily near bodies of water, like lakes and rivers, and in cooler temperatures. That’s why you often find fog early in the morning, dissipating as the weather warms up. 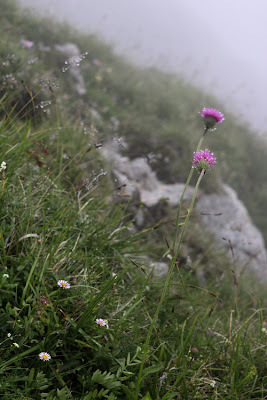 I’ve had the good luck to live two places now where fog is common: Oregon and northern Italy. It forms frequently here at my house in Italy, since we are right near the large Parco di Monza through which the Lambro River runs. A large, natural open space is a great source of fog – temperatures are always cooler in the park and the moisture is abundant from the landscape. Fog provides a great backdrop, to capture a single element. A distracting background can be completely hidden in the fog. I use this feature to capture silhouettes, like the lead-in image of the post and this image below. The detail is highlighted by the blank backdrop. I also converted both of these to black and white, to heighten the contrast. One thing to be careful of with fog is underexposure, because the light white background will dominate your camera’s meter readings. Play around with overexposing your images just a little bit to compensate. 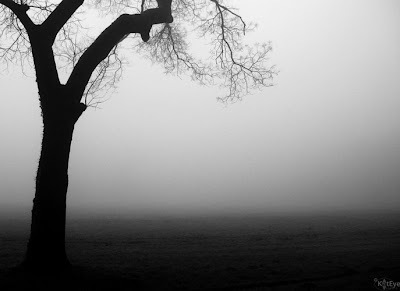 As you move closer to a object, fog slowly reveals. Vary your distance to a subject to create a different effect and feel in your images. The two images below are of the same tree on the same day, but taken at different distances. The first one, farther away from the camera, creates that sense of mystery I was talking about earlier. For both of these images, I again converted to black and white to heighten the contrast. 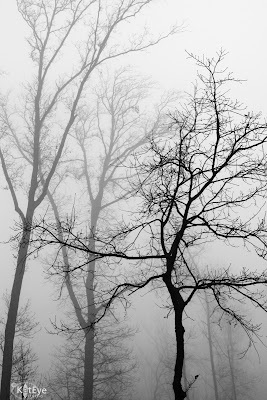 Fog desaturates colors and your images can look almost black and white straight out of the camera, but converting to black and white can keep the focus on the shapes and tones rather than what little color remains. 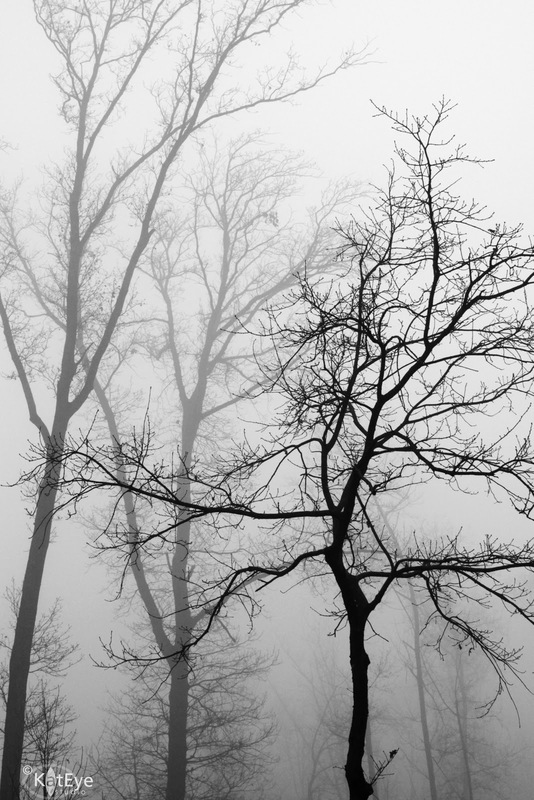 You can use fog to get a sense of depth in your photo. While photographers often manipulate the depth of field through aperture, you can also create depth using the atmosphere. Fog creates depth by successively lightening the objects in the background as you move away from the foreground. 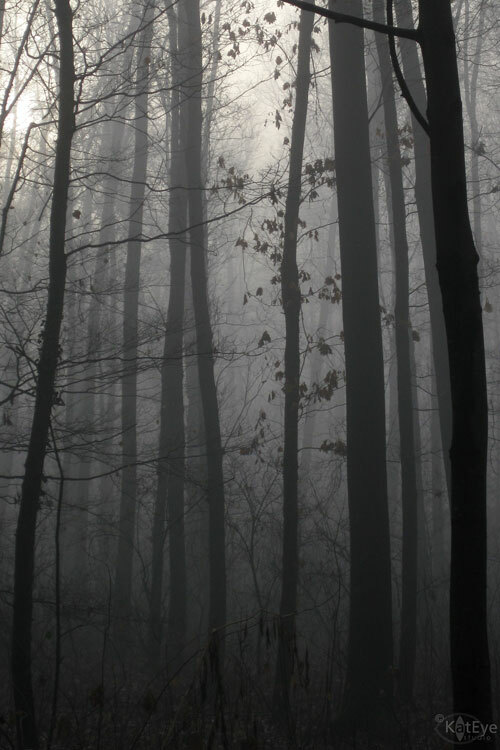 You can see this effect in the image of the trees below. 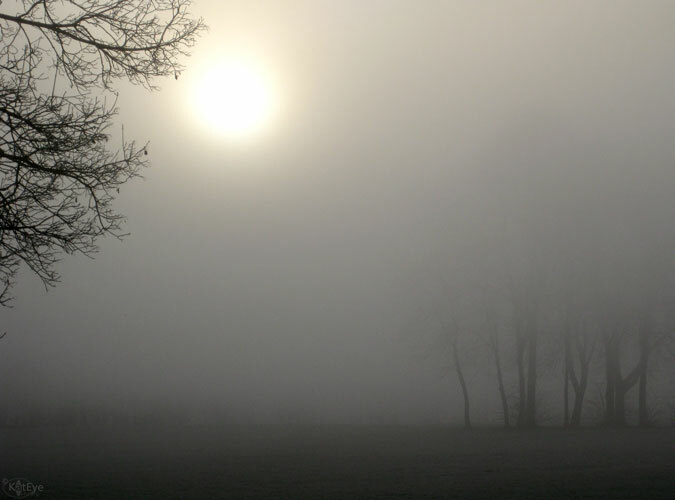 Light fog can give a subtle effect, as in the next example. Along with placement, focus and color, the sense of the largest tree as the focal point is enhanced by the fading trees behind. Heavy fog can make depth obvious, even at short distances. 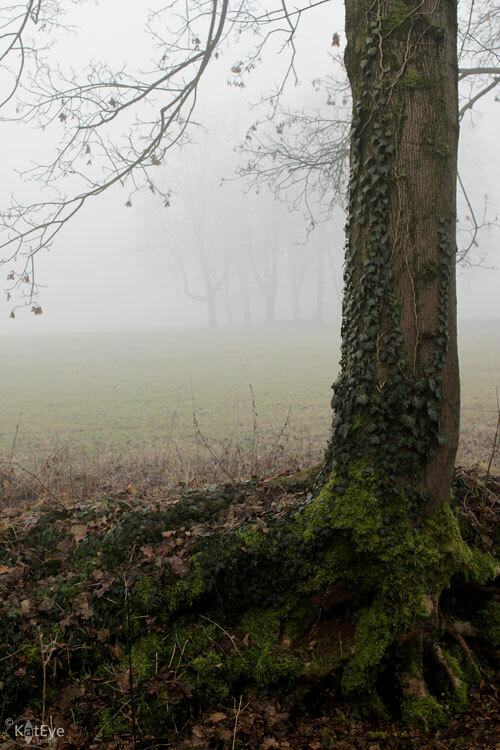 This image of a tree shows the effect of a heavy fog, the back of the tree already fading significantly compared to the front. All of these examples so far are from farther away, what happens when you get up close? You can see condensation on the surfaces. Get in close to see what I call “beads of fog” on the smaller objects around you. I’ve talked about what is revealed as you move through the fog, but also consider what is revealed as the fog is lifting. This image, taken looking up through the fog, shows the blue sky peeking through as the fog is burned away by the sun. 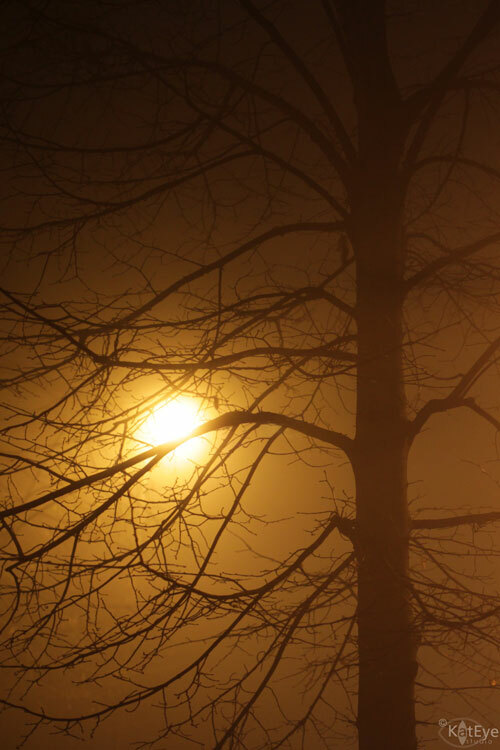 In this image, you can see how interesting it can be to capture the sun through the fog. This was an unusual day, because the fog seemed to be disappearing from the bottom up rather than the top down. Finally, don’t forget about capturing the world in fog at night. You know I love night! 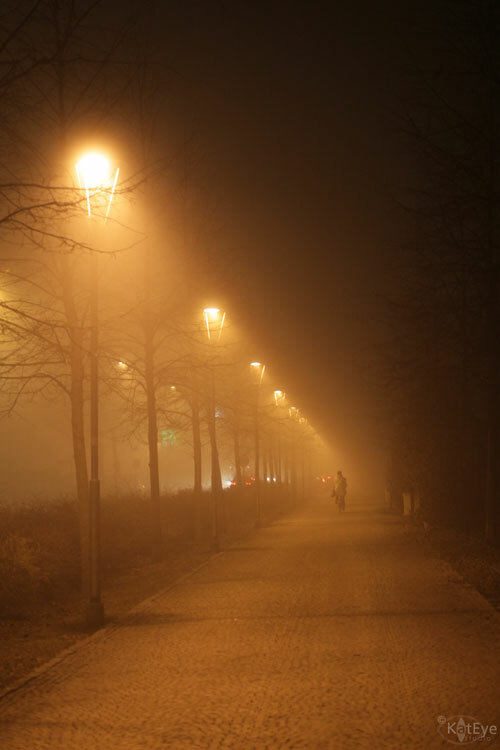 Fog seems to amplify the artificial lights of night, creating a warm glow that is unlike any other night effect. I did no color or exposure correction on these, I liked them as they came out of the camera. I know many of us are anxiously awaiting summer for the warmth and light of the sun. 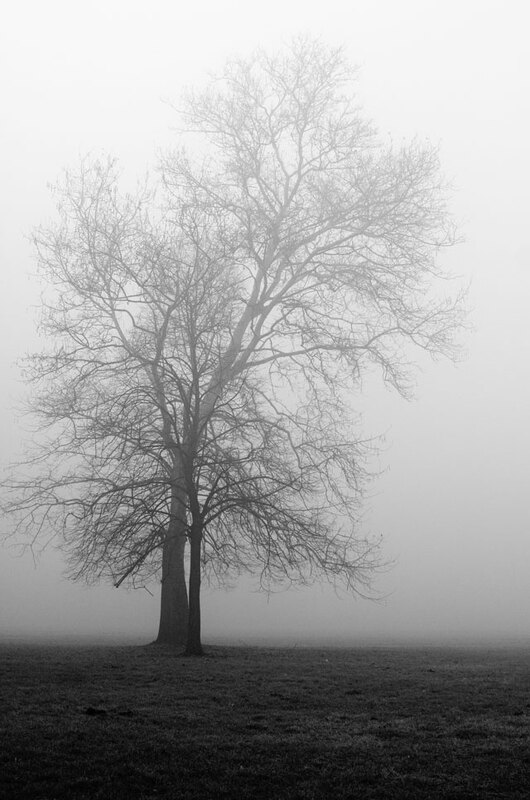 Instead of focusing on what you don’t have right now, take a moment to celebrate fog, one of the delightful gifts of winter. Today I am going to try something different! As a welcome to the participants in the Scavenger Hunt from Ashley Sisk’s Ramblings and Photos, I’m going to open the linky today and keep it open for two weeks. (If you are in a blog reader, come over to the blog to see the link tool.) I’ll still post the linky next Thursday for Share Your View as usual, if you want some time to capture the fog or look through your archive. In addition, I’m going to give away a set of my Black and White postcards by random drawing to one person who links in a fog photo. I haven’t given away a set of these yet on my blog, and since this set includes the foggy tree image it is the perfect time to give these away. Thanks for sticking with me! Good luck with your fog photos, I look forward to seeing what you capture. You can find the code to copy and paste the Exploring with a Camera button on your blog here. We’ve talked about how to Change up Your Schedule and Find a Regular Practice as keys to finding your passion and purpose. The next lesson from abroad is this: Get Out of Your Comfort Zone. Certainly, moving to a new place is a big change for anyone. Moving internationally, to a different culture is even bigger, because it goes to the fundamental assumptions of everything in your daily life. How you interact with other people, how you pay the bills, even how (and where) to find the essentials you need for daily living. Add in a different language, the added complication of not even being able to communicate basic questions and ideas, and you are set back even further. I literally felt like a child, and for a while my independence was completely gone and my confidence shattered. For some people, an international move may be a piece of cake. For me, and probably for many, it was significantly outside of my comfort zone. It seemed a big choice, a big risk in the initial decision. And it was a big stress, with the move and subsequent adjustments. Not only dealing with my own insecurities and stresses, I had my family along in this adventure – I had to worry about them too. We went through all of the phases with any big adjustment – the “what the hell did I do” phase, the honeymoon period of excitement, the frustration period of learning to do things differently, and finally acceptance. I am in a good place now, in our second year of the assignment. I have learned to love much about this beautiful country, and accept the things that I don’t. When you have the opportunity to really shift out of your comfort zone like I have, you start to see things in a different light. In addition to really looking at the fundamental assumptions I was making in life, I have noticed where I was placing unnecessary restrictions on myself. I can now recognize the rules that I had placed on myself and my life, as well as the rules that our culture places on us. I’ve started to question those “rules” as they come up. I examine each one and ask myself, “Do I need this rule? What does it get me? What does it provide others? Do I want to keep it or throw it away?” And I recognize that for each one I throw away, others in my life might not understand or be happy about it. I have to be willing to deal with the results, but it’s important to first be able to see the rules, or you can’t ever decide to change them. Getting out of my comfort zone with this move has also shown me that I was expecting perfection of myself, or something close to it, since I was comfortable where I was. When you get to a place you are good at something, it’s hard to go back to being a novice again, in any area of our life. It’s hard to accept the fact that you make mistakes, because you get so used to not making them. You have to learn to laugh at yourself again, enjoy the new-ness of something, delight in those first experiences. Let yourself be the beginner for a while. The only way that you can learn something new is to open yourself up to risks and move beyond the current state. You can’t expect perfection right out of the gate. In reflecting on this experience, I can see that this move was not unlike other times in my life that I’ve gotten out of my comfort zone. Whether big or little changes, they have had similar effects. Getting out of your comfort zone does this amazing, wonderful thing – it doesn’t just shift the realm you are comfortable operating in, it grows it. That’s why difficult situations are often called “stretching” or “growing.” When you get out of your comfort zone, there is that initial discomfort, but over time, with practice, you gain new skills and confidence. You’ve added to what you can manage in your life, the landscape you can negotiate. When you can add to your life in this way, there is this important side effect that can directly lead you to your passion and purpose: You can begin to see new possibilities. Thoughts or ideas that would never have seemed plausible before can become real. 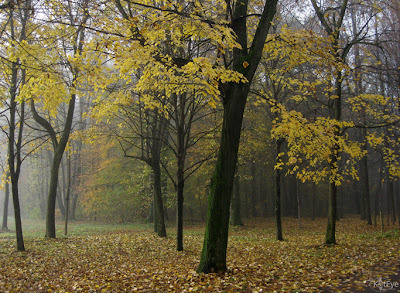 As I was walking in the park this week (part of my regular practice), I was enjoying the first fog of the season and came up with a wonderful analogy. 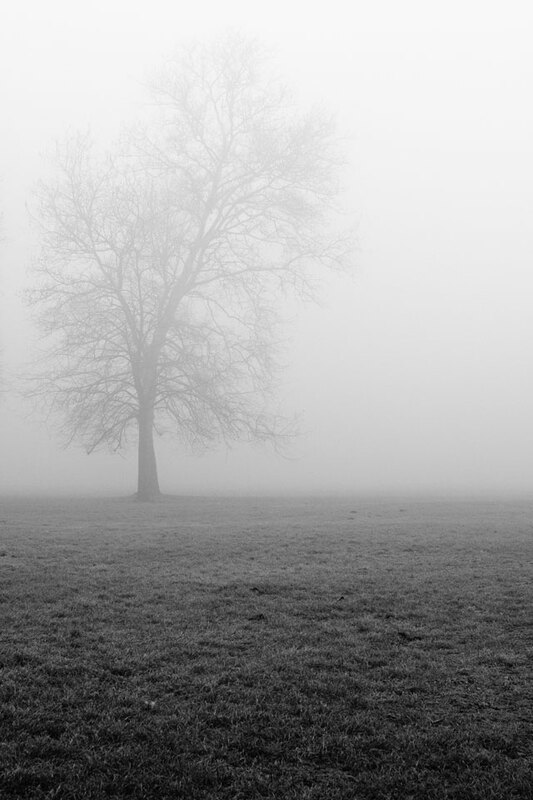 Often, when you get out of the comfort zone of your life, it can feel like you’re in the fog. You can’t see to far ahead, only the next few steps in front of you. More and more is revealed as you move further. It can feel scary and uncertain. But once in a while in the fog, if you stop and look around, look up, you can see a glimpse of what the day is going to be like – the blue sky and sun. That’s the new possibility that you can only see as you start to look at the world in different ways, because the fog obscures your normal view. You won’t notice this little glimpse of your future, without the fog, or the shift in your comfort zone. How can you get out of your comfort zone, and gain the benefits of this new perspective? How can this help you connect with your passion and purpose? Actively seek an opportunity to move out of your comfort zone. Maybe it’s a job change, taking on a different assignment. Maybe it’s a new activity. Have you had an urge to take an art class, even though you have no previous experience? How about drama – putting yourself out there in front of others? Maybe it’s learning about an aspect of technology. Maybe it’s a change in relationships – adding, removing, changing your interactions with people. Maybe it’s travelling to a new place. Anything that you might have the thought, “Yeah, that looks interesting but I could never do it for reasons x, y, z.” Why not try? I started painting while in Italy, just because I got the urge. That activity led to me really exploring my creativity and the beauty of the world around me in a whole new way. Recognize that uncomfortable feeling you get when you step out of your comfort zone. Acknowledge it, accept it, but don’t run away. A natural way to react when you feel uncomfortable is to turn around and go right back to where you were. The first step to recognize, acknowledge and accept. Then take a deep breath and move forward. The uncomfortable feeling will still be there, but know you are doing this for a reason – it’s called growth. Be willing to let yourself be a novice. People who are new to things make mistakes. Their work isn’t the best. It’s really hard to go from being on the top of your game to being the newbie when you step out of your comfort zone. Instead of avoiding mistakes, give yourself permission to be bad at whatever you are doing, but keep going. Learn from the mistakes, the “failures.” Laugh at yourself as much as possible, and seek others who will help you keep this light-hearted perspective. You might find that the failures aren’t so bad after all. One of the best things that I have learned in this experience is to laugh at myself. To marvel at just how little I actually know! Keep track of those little rules that pop into your head. The ones that say, “I never…” or “I should…” Write them down, really take a hard look at them. Are they real? What can you do to remove them? What would life look like if you no longer lived by this rule? Make a decision, whether or not you want to keep this rule. Maybe observe when you use it, and if it’s serving to keep you safely rooted in your comfort zone or if it will help you move in the direction you want to go. I have recently been pondering the quote, “If you do what you’ve always done, you will get what you’ve always gotten.” I can’t really argue the truth of this statement. How do you get something different, something better, if you do the same things all of the time? You can’t. Life doesn’t work that way. The only way to get something more – whether it’s time or money or relationships or personal growth – is to do something different, take a risk, move through the fear that holds us at the status quo. Move out of your comfort zone. 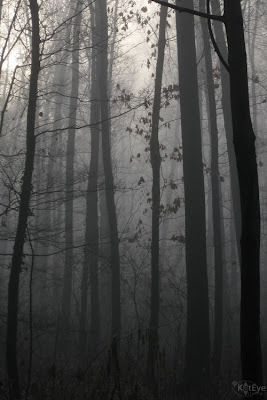 Yesterday was the first really foggy morning in Parco di Monza of the season. I love fog, how it blankets everything and slowly reveals more as you move through it. I like this photo, which gives a hint of what the day is going to become, all sun and blue sky, while still showing the deep fog that exists down below. Maybe it’s an analogy for the direction in our lives, when we are having trouble seeing where we might be going. Instead of looking forward, try looking up. I’m inviting you to take another look today too. I know many folks use blog readers – I do! – and don’t visit my actual site that often. I’ve made a number of changes lately, and so I’m inviting you to come by and take a look! To motivate you, I’m going to have a little contest too… Come explore the site a little bit, then leave a comment with what “new” thing you specifically like on my blog, to enter to win. Contest will end on Sunday morning, 7am my time, and I’ll randomly select a winner from all of the comments that include something specific. If you are new to my blog, just comment on what you liked the first time you visited! I would love to hear your thoughts. What will you win? 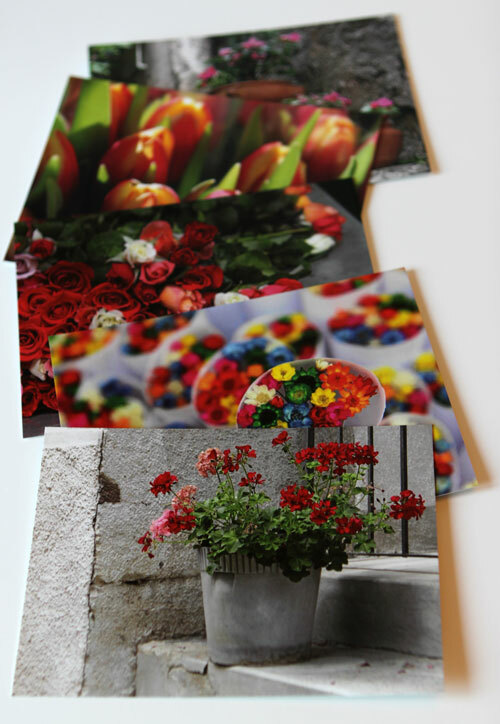 Hopefully, a set of postcards, either those pictured below or one of my new sets, if they arrive soon! I ordered more postcards in September (I still owe some to a few of you, I haven’t forgotten) and they have been lost in the mail twice. I know, I wouldn’t believe it either if it hadn’t happened to me. So they should be reprinted and mailed this next week and I’ll be able to get them out to you. If they don’t arrive in a timely manner, I’ll find some other interesting Italian thing to give away to you. I have some ideas brewing! So it’s kind of like a mystery giveaway – either the postcards or something behind door number two! 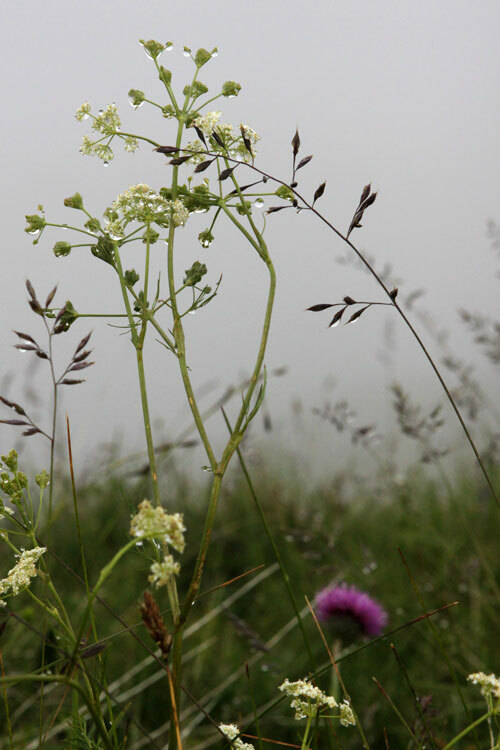 What happens when it’s cloudy and foggy on the mountaintop you visit? What happens when you look out and around and all you can see is a soft white? You start to notice the little details, close at hand. 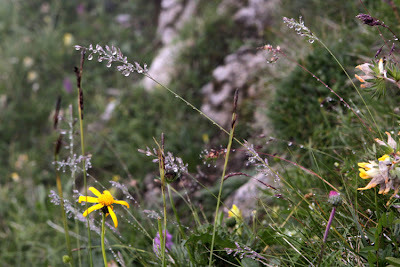 The way the fog beads up on the alpine grasses and flowers, like little crowns. The softness of the light and the splashes of color of the wildflowers against the patina of the tundra. The way the fog fades into the distance, providing a perfect backdrop to capture shining edges of nature’s summer blanket in the Alps. Who needs grand vistas, anyway?